Earlier this week Warner Bros. Home Entertainment, Inc. settled Federal Trade Commission charges that it deceived consumers during an influencer marketing campaign for the video game Middle Earth: Shadow of Mordor, by failing to adequately disclose that it paid online influencers. Felix Kjellberg a.k.a PewDiePie was among the influencers included in the Warner Bros. influencer marketing campaign which saw gamers paid to post gameplay videos on YouTube and other social media platforms. 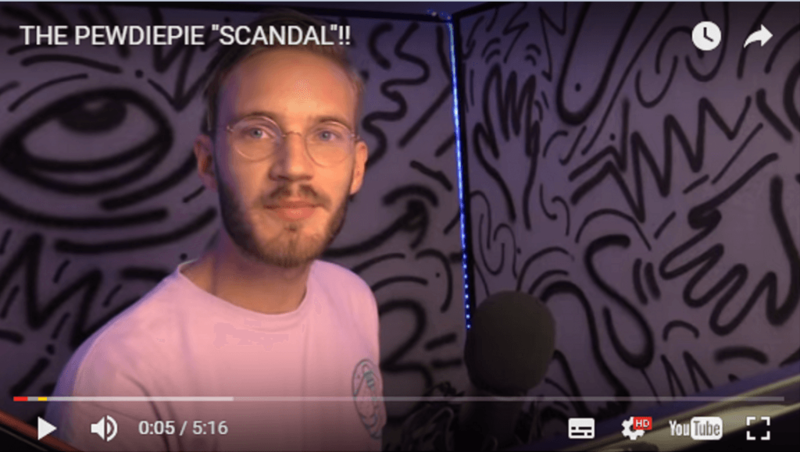 PewDiePie has responded via vlog – not unsurprisingly – to the charges this week that Warner Bros. paid him and other digital influencers to promote a video game in 2014 and that proper disclosure wasn’t made. PewDiePie comes off well in his video. His delivery is everything we love about YouTube creator ‘megastars’. He’s passionate, relatable, authentic and unvarnished. He’s also become massively wealthy from his YouTube career earning a reported $12m in 2015 according to Forbes. There are other reasons the Swedish gamer would want to make a clear stance on the situation. PewDiePie is no longer a solo act. In January 2016 he launched his own MCN (multichannel network), Revelmode. Distancing himself from Warner Bros. won’t hurt either. Revelmode is part of the Maker Studio MCN – a division of The Walt Disney Company. The FTC charge against Warner Bros. wasn’t that the sponsorships including PewDiePie’s were not disclosed. The YouTuber shows his audience in the vlog that he did disclose the commercial relationship with Warner Bros. The charge was that disclosures were not done so “clearly and conspicuously.” The FTC said disclosures in the description of the videos weren’t adequate. The Swedish vlogger does admit he could have done a better job of disclosing the commercial nature of his content. FTC guidelines state that an influencer must disclose, clearly and prominently, whether content has been paid for. The FTC settlement with Warner Bros. does raise an interesting point about the permanent nature of YouTube videos. PewDiePie reminds us that the videos were made in 2014. The FTC did not produce guidelines on influencer endorsements until May 2015 and on native advertising until December 2015. Creators should be encouraged to go through their back catalogue of content and make sure it all complies with current disclosure (and Google guidelines). Meeting disclosure regulations is the duty of all parties – of the commissioning brand, the creator and the PR practitioner managing the work. Many brands still try to hide the commercial relationship they have with their influencer. They think that prominently disclosing that the content is paid for will detract from the content’s authenticity of voice. His response? “I don’t F**king need you. I have an audience. I can talk to them.”Going further he calls mainstream media “insignificant” and infers that they know it too. PewDiePie does have his own audience. He has a YouTube subscriber base larger than the population of Spain at 46.2 million. His videos have been watched 12.7 billion times. This leads on to my last point. The FTC name checks PewDiePie in its settlement documentation with Warner Bros labelling him as “wildly popular”. This can’t fail to help the FTC’s cause in driving home its point that influencers gotta disclose. I just did a quick Google search on “Lord and Taylor FTC” -the last significant influencer marketing settlement between a brand and the FTC over disclosure rules. The search surfaced 357,000 results. This is why Motorola is sensible about disclosure – They ask that any content they sponsor reflects that fact. Basically they put themselves in the shoes of whomever is going to consume that content. So simple! What Mr. Pie (LOL) said is correct. The only thing I personally question is whether he did in fact approve of the Warner Brothers game, but I can only assume he did, because he has the trust of his followers and would presumably want to keep that intact. Here’s what brands aren’t understanding. If you pay influencers, FINE. What people despise is if you don’t tell us that you paid, then suddenly there’s a deluge of “positive” (wink wink) “reviews” and then WE FIND OUT that you paid. Don’t fcking insult our intelligence. This is carryover from the early days of Madison Avenue where everything operated on the premise of “People are stupid and we must capitalize on that.” In case marketers haven’t noticed, that era was decades ago, and that approach is as vile as it is old. Absolutely agree! in the further reading portion of the post there’s a link specifically to dos and don’t about reviews. Thanks for your comment Alex.